The terrain in the west are rugged mountains of volcanic origin. In the middle of the country are low hills and in the east is a low mountain range. Lowlands line both the Caribbean and Pacific coasts, and there are many offshore islands. The climate is tropical with abundant rainfall. Over half the population is urban. Spanish is the official language, and many Panamanians also speak English. 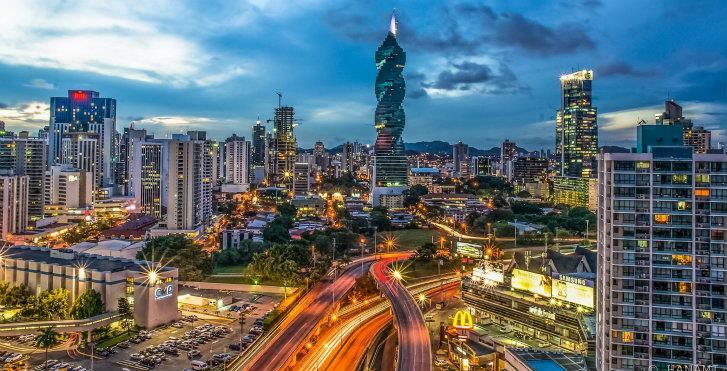 The economy in Panama has become largely service based, with banking, tourism, and commerce all playing important roles. Only about a quarter of the land is used for agriculture. On the upland savannas cattle are grazed and subsistence crops such as rice, sugarcane, cocoa, and coffee are grown. Bananas are grown on the Pacific coast. The country has various light industries. The Colón Free Zone, established in 1953, is a center for foreign investment in manufacturing.Banana are the leading export, followed by shrimp and fish products, sugar, clothing, and coffee.